Ordrupgaard is a state-owned art museum situated near Jægersborg Dyrehave, north of Copenhagen, Denmark. The museum houses one of Northern Europe’s most considerable collections of Danish and French art from the 19th and beginning of the 20th century. Ordrupgaard was founded 1916–1918 by former Hafnia managing director, titular Councillor of State Wilhelm Hansen (art collector) [da] (1868–1936) and his wife Henny Hansen. Wilhelm Hansen established his collection of Danish art covering the 19th to the beginning of the 20th century during the period of 1892 to 1916. The Danish Golden Age is comprehensively represented by works by, amongst others: Christoffer Wilhelm Eckersberg, Christen Købke, Johan Thomas Lundbye, P.C. Skovgaard and Wilhelm Marstrand. The main part of the collection, however, testifies to Wilhelm Hansen’s interest for contemporary art with works by artists such as: L.A. Ring, Vilhelm Hammershøi and Theodor Philipsen, not forgetting the Fynbo Painters Johannes Larsen, Fritz Syberg and Peter Hansen, Wilhelm Hansen’s childhood friend. During World War I, Wilhelm Hansen focused his interest on French art. From 1916 to 1918 he purchased French paintings, pastels, drawings and sculptures, thus laying the foundation for an actual art museum. It was Wilhelm Hansen’s great wish to acquaint the Danes with French 19th-century art. His first purchases were paintings by Alfred Sisley, Camille Pissarro, Claude Monet and Auguste Renoir. Wilhelm Hansen’s main focus was on French Impressionism. In order, however, to put Impressionism into perspective, his collection also comprised the genres immediately preceding and following. Thus, Ordrupgaard is able to show Eugène Delacroix, representing Romanticism, Théodore Rousseau (the Barbizon School), Gustave Courbet (Realism), Édouard Manet (Modernism), and Paul Gauguin (Symbolism). When purchasing French art, Wilhelm Hansen often took advice from the French art critic Théodore Duret (1838–1927). Parallel to Wilhelm Hansen’s interest in Danish and French art was his interest for furniture and handicrafts. He was especially interested in ceramics, chandeliers and furniture executed by Thorvald Bindesbøll (1846–1908). This consortium, founded in 1918 by Wilhelm Hansen together with the collector Herman Heilbuth (1861–1945) and art dealers Winkel & Magnussen, was of great importance to the French purchases. Their declared goal was "Buying and selling works of art with the purpose of bringing good and outstanding art to Scandinavia". For this reason they bought several collections "en bloc" in Paris. Wilhelm and Henny Hansen bought a large piece of land by Ordrup Krat, near Jægersborg Dyrehave, north of Copenhagen, Denmark. Between 1916 and 1918 they built their stately home Ordrupgaard, designed by architect Gotfred Tvede [da] (1863–1947). At the same time an extensive park was laid out by landscape gardener Valdemar Fabricius Hansen (1866–1953). Ordrupgaard was inaugurated on 14 September 1918. In his opening speech, Wilhelm Hansen declared that the collection would be left to the Danish State. 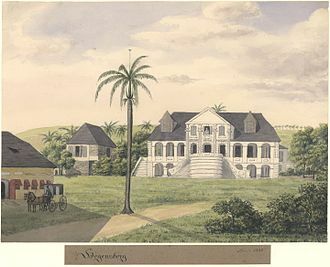 Ordrupgaard was originally built as a three-winged trellised country mansion in the neo-classical style. The gallery which houses the French collection is connected to the main building by a small conservatory. Additionally a porter’s lodge, a driver’s residence (now demolished) and a coach house (now named "Lavendelhuset"/ The Lavender House) were erected. A shed and a small half-timbered summerhouse comprise the rest of the original buildings on the estate. The Park at Ordrupgaard is laid out in the English style with a smaller French-inspired rose garden, originally adorned by a ceramic fountain by Jean Gauguin (now placed in the conservatory due to conservational reasons). The Park at Ordrupgaard originally functioned as a kitchen garden as well as a flower garden. The extensive produce and the many fruit trees sustained the family with fresh fruit and vegetables throughout the year while the rest of the grounds were used for leisure and contemplation. From the summerhouse could be viewed, at the far end of the park (where now there is a meadow) a small lake encompassing an island complete with rowing boat. There were also small ponds around the grounds, which have since been filled in. 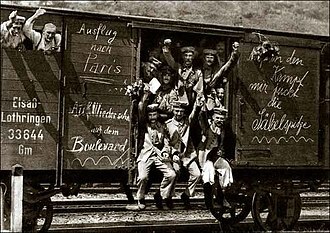 In 1922, Wilhelm Hansen suffered a massive financial and personal loss. 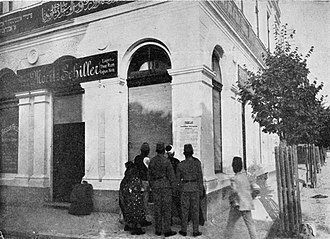 "Landmandsbanken", in which the Consortium had taken loans for the purchase of art works, collapsed. In order to pay off his debt Wilhelm Hansen sold more than half of his French collection – approximately 82 pieces. Among these were important works by Paul Cézanne, Édouard Manet and Paul Gauguin. Many of these works are now housed at the "Ny Carlsberg Glyptotek" in Copenhagen and "The National Museum of Western Art" in Tokyo. Wilhelm Hansen overcame the crisis and from 1923 to 1933 compensated for his losses by buying new, specifically French paintings, which are still at Ordrupgaard. After the death of Wilhelm Hansen in 1936, Henny Hansen lived on alone at Ordrupgaard. At her death in 1951, she left the collection, the house and the park to the Danish State, as Wilhelm Hansen had wished. In 1953, Ordrupgaard was opened to the public as a state-owned art museum. 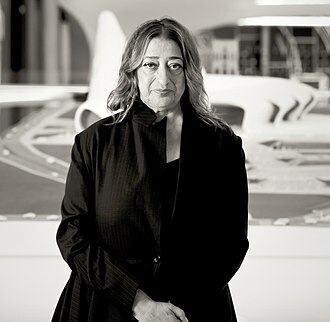 On 30 August 2005, Ordrupgaard inaugurated the new extension designed by the Iraqi-born architect Zaha Hadid (1950–2016). The extension measures 1,150 sq.m. and has improved the space, climate and security conditions so that Ordrupgaard is now able to present special exhibitions at an international level. The extension is constructed in glass and black lava concrete joined together to form a deconstructivistic and organic body. From 1941 to 1942, furniture designer Finn Juhl designed and furnished his own house next door to Ordrupgaard. The house is one of the first functionalistic one-family houses in Denmark. Here Finn Juhl lived until his death in 1989. Finn Juhl’s widow Hanne Wilhelm Hansen left the house and its interior unchanged. On 3 April 2008, the house opened as a separate, additional part of Ordrupgaard Art Museum, thanks to a private donation from Birgit Lyngbye Pedersen. Madsen, Karl: Malerisamlingen Ordrupgaard. Wilhelm Hansens Samling. Malerier, Akvareller, Pasteller, Tegninger af franske Kunstnere, København 1918. Swane, Leo: Etatsråd Wilhelm Hansen og hustru Henny Hansens malerisamling, Katalog over kunstværkerne på Ordrupgaard, København 1954. Rostrup, Haavard: Etatsraad Wilhelm Hansen og hustru Henny Hansens malerisamling. Catalogue of the Works of Art in The Ordrupgaard Collection, København 1966. Asmussen, Marianne Wirenfeldt: Wilhelm Hansens oprindelige franske samling på Ordrupgaard. Wilhelm Hansen’s Original French Collection at Ordrupgaard, København 1993. Wivel, Mikael: Ordrupgaard. Selected Works. København 1993. Birgitte Anderberg & Thomas Lederballe (ed. ): Ordrupgaard: Danish Art from the Century of the Golden Age, Copenhagen 1999. Lederballe, Thomas and Rabinow, Rebecca (ed. ): The Age of Impressionism. European Paintings from Ordrupgaard, Copenhagen 2002. Wikimedia Commons has media related to Ordrupgaard. The Carlsberg Group is a brewing company founded in 1847 by J. C. The companys first headquarters were located in Copenhagen, since Jacobsens death in 1887, the majority owner of the company has been the Carlsberg Foundation. The companys flagship brand is Carlsberg Beer but it brews Tuborg, Somersby cider, Russias best-selling beer Baltika, Belgian Grimbergen abbey beers, and more than 500 local beers. After merging with the assets of Norwegian conglomerate Orkla ASA in January 2001. After a failed attempt by Orkla, Carlsberg became the sole owner after purchasing Orklas share in the brewery in 2004. It is the leading beer seller in Russia with about a 40 percent share of the market, in 2009 Carlsberg ranked fourth worldwide, and employed around 45,000 people. Carlsberg was founded by J. C, Jacobsen, a philanthropist and avid art collector. 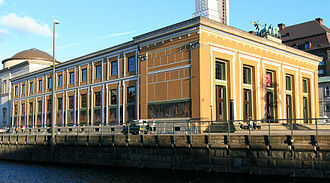 With his fortune he amassed an art collection which is now housed in the Ny Carlsberg Glyptotek in central Copenhagen. The first brew was finished on 10 November 1847, and the export of Carlsberg beer began in 1868 with the export of one barrel to Edinburgh, Jacobsens son Carl opened a brewery in 1882 named Ny Carlsberg forcing him to rename his brewery Gamle Carlsberg. The companies were merged and run under Carls direction in 1906, Jacobsen set up the Carlsberg Laboratory in 1875, which worked on scientific problems related to brewing. It featured a Department of Chemistry and a Department of Physiology, the species of yeast used to make pale lager, Saccharomyces carlsbergensis, was isolated by Emil Christian Hansen at the laboratory in 1883 and bears its name, this was shared freely by Carlsberg. The Carlsberg Laboratory developed the concept of pH and made advances in protein chemistry, in 1972, the Carlsberg Research Centre was established and the Carlsberg Laboratory is now an independent unit of the Centre. Because of a conflict with his son Carl, Jacobsens brewery was left to the Foundation upon his death in 1887, the first brewery to be built outside Denmark was in Blantyre, Malawi in 1968. Carlsberg merged with Tuborg breweries in 1970 forming the United Breweries AS, Carlsberg became the sole owner of Carlsberg-Tetley in 1997. In 2008 Carlsberg Group, together with Heineken, bought Scottish & Newcastle, in 2013 the company joined leading alcohol producers as part of a producers commitments to reducing harmful drinking. Laurits Andersen Ring was one of the foremost Danish painters of the turn of the 20th century, who pioneered both symbolism and social realism in Denmark. Considered one of the masterpieces of Danish culture, his painting Summer Day by Roskilde Fjord was included in the 2006 Danish Culture Canon, born as Laurits Andersen in the village Ring in southern Zealand Rings parents were wheelmaker and carpenter Anders Olsen and farmers daughter Johanne Andersdatter. In 1869, he became an apprentice because his older brother was to take over the fathers workshop. He was never content with the academy and disliked the strict training in classical disciplines, Laurits became L. A. Ring, and his friend Hans became H. A. Brendekilde. 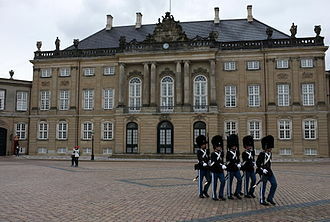 Rings first exhibition took place in 1882, but he did not acquire recognition until 1884, at this time, Denmark was in political turmoil, as the Council President Estrup had bypassed democratic rule and governed through decrees. 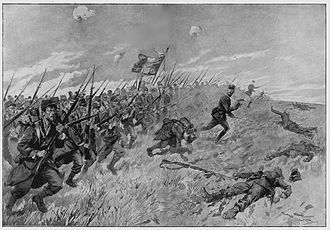 Ring was politically active in the Rifle movement, a group of students taking up arms training in preparation for a rebellion. Ring became increasingly interested in the difficulties of the poor and social justice for the lower classes, while he lived in Copenhagen, he became a close friend of the family of lawyer and amateur painter Alexander Wilde. He spent Christmas and summers with the family and formed a friendship with Wildes wife. Ring was deeply in love with her but she remained faithful to her husband, Ring painted many tender portraits of Mrs. Wilde. As Ring realized that the relation would never materialize he turned his back on the Wildes, in 1893 he received a travel stipend and spent the year studying in Italy. In 1894, Ring was used as a model for a character in the novel Night watch by the Danish author and Nobel prize winner Henrik Pontoppidan, an old friend of his. Ring served as a model for the unflattering character Thorkild Drehling, a painter and failed revolutionary, Ring did not object to the unflattering depiction, but he was offended that Pontoppidan would publicly divulge his infatuation with Johanne Wilde in that way. The Louisiana Museum of Modern Art is an art museum located directly on the shore of the Øresund Sound in Humlebæk,35 km north of Copenhagen, Denmark. The museum is acknowledged as a milestone in modern Danish architecture, noted for the synthesis it creates of art, the museum has at occasions exhibitions with works of the great impressionists and expressionists, like the large Claude Monet impressionist exhibition in 1994. The museum is included in the Patricia Schultz book 1,000 Places to See Before You Die, the name of the museum derives from the first owner of the property, Alexander Brun, who named the villa after his three wives, all named Louise. The museum was created in 1958 by Knud W. Jensen and he contacted architects Vilhelm Wohlert and Jørgen Bo who spent a few months walking around the property before deciding how a new construction would best fit into the landscape. This study resulted in the first version of the museum consisting of three connected by glass corridors. Since it has been extended several times until it reached its present circular shape in 1991, in late November 2012 Louisiana Museum of Modern Art launched Louisiana Channel, a web-TV channel contributing to the continual development of the museum as a cultural platform. In 2013 the music department of the museum launch Louisiana Music, the videos are often housed in room settings where the viewer is made to feel part of the scene being portrayed. Perched above the sea, there is a garden between the museums two wings with works by artists including Henry Moore, Alexander Calder, and Jean Arp. Besides the collection of art, Louisiana displays a collection of Pre-Columbian art. Consisting of more than 400 objects, the collection was a donation from the Wessel-Bagge Foundation in 2001 and it is the personal collection left by Niels-Wessel Bagge, who was a Danish dancer and art collector living in California and who died in 1990. The Concert Hall was built in 1976 in connection with the West Wing which had built in 1966 and 1971. Its acoustics make it fit for chamber music but it is used for other musical genres as well as a wide array of others events and activities such as debates, lectures. The chairs are designed by Poul Kjærholm and the wall is decorated with paintings created for the site by Sam Francis. Finn Juhl was a Danish architect and industrial designer, most known for his furniture design. He was one of the figures in the creation of Danish design in the 1940s. He was admitted to the Architecture School at the Royal Danish Academy of Fine Arts where from 1930 to 1934 he studied under Kay Fisker, after graduating, Juhl worked for ten years at Vilhelm Lauritzens architectural firm, where he had apprenticed as a student. In 1943 he received the C. F, in 1945 he left Vilhelm Lauritzens company and set up his own design practice, in Nyhavn in Copenhagen, specializing in interior and furniture design. However, his work in furniture design began earlier than that, his early chairs were originally produced in small numbers, eighty at most, because the Guild-shows emphasized the work of the artisan over the burgeoning industry of mass production. However, they were almost all reissued in his career, the projects was highly controversial and Juhls first work met much criticism. His Pelican chair, designed in 1939 and first produced in 1940, was described as a tired walrus, in spite of the initial criticism, Juhls work began to influence the style of homes abroad throughout the 40s. In 1948 Edgar Kaufmann, Jr. leader of the Department for Industrial Design at Merchandise Mart in New York and he intentionally did not visit only the big Scandinavian exhibitions, but being impressed by Juhls work he presented it in a large article in the Interiors magazine. In 1951 he participated in the Good Design exhibition in Chicago, in connection with the show he was quoted in Interiors for stating that One cannot create happiness with beautiful objects, but one can spoil quite a lot of happiness with bad ones. At the Milan Triennale in the 50s, he won a total of five gold medals, during this decade he continued to design more specifically for the mass market than had been the case in the 40s. In the 60s and 70s he experienced a declining interest in his designs, in the 80s and 90s the interest resurged. In 1951–52 he designed the Trusteeship Council Chamber in the United Nations headquarters in New York City and he collaborated regularly with companies such as Georg Jensen and Scandinavian Airlines, his work for the latter including both ticket offices and interiors of planes. Berthe Marie Pauline Morisot was a painter and a member of the circle of painters in Paris who became known as the Impressionists. She was described by Gustave Geffroy in 1894 as one of les trois grandes dames of Impressionism alongside Marie Bracquemond, in 1864, she exhibited for the first time in the highly esteemed Salon de Paris. Sponsored by the government, and judged by Academicians, the Salon was the official, annual exhibition of the Académie des beaux-arts in Paris and it was held at the studio of the photographer Nadar. She was married to Eugène Manet, the brother of her friend, Morisot was born in Bourges, into an affluent bourgeois family. Her father, Edmé Tiburce Morisot, was the prefect of the department of Cher and he studied architecture at École des Beaux Arts. Her mother, Marie-Joséphine-Cornélie Thomas, was the great-niece of Jean-Honoré Fragonard and she had two older sisters and Edma, plus a younger brother, born in 1848. The family moved to Paris in 1852, when Morisot was a child and it was common practice for daughters of bourgeois families to receive art education, so Berthe and her sisters Yves and Edma were taught privately by Geoffroy-Alphonse Chocarne and Joseph Guichard. Morisot and her sisters initially started taking lessons so that they could make a drawing for their father for his birthday. In 1857 Guichard, who ran a school for girls in Rue des Moulins, introduced Berthe and Edma to the Louvre gallery where they could learn by looking and he introduced them to the works of Gavarni. Guichard became the director of École des Beaux Arts where Morisots father earned his degree, as art students and Edma worked closely together until Edma married Adolphe Pontillon, a naval officer, moved to Cherbourg, had children, and had less time to paint. Letters between the show a loving relationship, underscored by Berthes regret at the distance between them and Edmas withdrawal from painting. Edma wholeheartedly supported Berthes continued work and their families always remained close, Edma wrote “… I am often with you in thought, dear Berthe. I’m in your studio and I like to slip away, if only for a quarter of an hour and her sister Yves married Theodore Gobillard, a tax inspector, in 1866, and was painted by Edgar Degas as Mrs Theodore Gobillard.